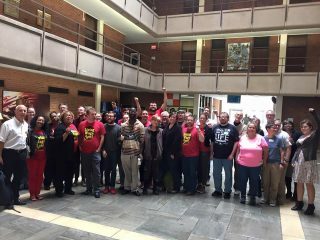 In August 2015, United Campus Workers (a Communication Workers of America local union) learned of a secret plan being pushed by Tennessee’s Governor Bill Haslam to privatize the building management, maintenance, and security at every single piece of Tennessee state-owned property – every campus, office building, park, hospital, prison, even the national guard armories – costing the jobs of 1 in 5 state workers! This a threat for all their states if it were to be implemented in Tennessee. Union members unfurled a petition dozens of feet long in the halls of the state Capitol. As increased media coverage uncovered the full extent of the Governor’s plans – he had directed his staff to secretly begin the push as far back as October 2014 – issues of public accountability and government secrecy became key concerns. It was clear that Haslam’s staff had hoped to accomplish the outsourcing largely behind closed-doors, with as little public knowledge and even less public oversight. Joined by new allies like the League of Women Voters and the Tennessee Coalition for Open Government, campus workers continued organizing. Additional street pickets and speak outs were held; media interviews were given; and at grocery stores, in church meetings, and door-to-door in neighborhoods workers collected petition signatures against the plan. In November 2015, hundreds of workers convened at the governor’s office to deliver the first batch of petition signatures, numbering close to 5,000. One by one, state workers, students, clergy, and everyday Tennesseans from all different backgrounds walked into the governor’s office and delivered oversized envelopes each containing several hundred petitions and handed them to the governor’s staff. The workers’ chants echoed through the capitol building and lead nightly news across the state. What Haslam and his cronies had hoped to be a fast-paced project in secret has been anything but that. Because of the workers’ determination the governor’s staff had to go back to the drawing board, largely scrapping their initial plan. Mobilizations continued throughout the 2016 Legislative Session, with workers marching on state legislators, having call-in days, more street pickets, prayer breakfasts, mass meetings, movie screenings, etc. Actions escalated to shutting down the halls of Legislative Plaza while workers unfurled 50-foot-long banners with name of more than 10,000 Tennesseans opposing the plan. The initial plan wanted a contractor in place, preforming the work, as of August 2016. That date has come and gone, and the work is still in-house, being preformed daily by the state worker professionals. The fight has caused Governor Haslam and his team to change their tactics – from secrecy to siege-warfare. They now intend to drag out the process in the hopes that the cumulative stress of possible layoffs over a two-year period can break the workers’ collective resolve. But the workers and their union, UCW-CWA remain in motion. In the past few weeks alone workers have held another round of events, including a partner meeting with other unions, community groups, and clergy, and a public vigil. UCW-CWA is building for another major mobilization at the state capitol in late January 2017.